How many times have you passed up a sleeping figure underneath a blanket or tarp on the darkened streets of your city? Have you ever considered that this could be one of our war heroes? This question entered my consciousness in the summer of 2007. As partners of a video production company called Crystal Pyramid Productions, my husband, Mark Schulze, and I received a call from the Veterans Administration to document the 20th Annual Stand Down in San Diego, CA. “Stand Down,” we wondered. “What’s that?” We learned that in military parlance, a stand down is when a soldier steps away from combat operations and experiences a momentary rest and relaxation prior to heading back into the fray. Its definition has been extended to name an event which addresses the plight of homeless veterans on the streets of America. 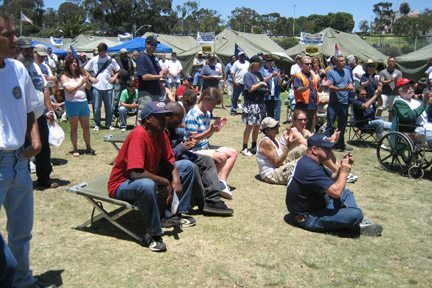 The San Diego Stand Down sustains homeless veterans for three days with hot meals, cots, showers, shaves and haircuts, plus a change of clothing. The veterans can receive medical, dental and holistic treatments, as well as counseling and legal advice from caring volunteers—all in one location. They enjoy camaraderie with fellow veterans and best of all, they don’t have to worry about the “combat” that takes place daily out on the streets. It occurred to me that after the three days of relative “luxury” at Stand Down, 715 participants would have to go right back to the streets. On our way home from the shoot, I cried for these men and women who had served their country, many of whom now suffer with Post Traumatic Stress Disorder, and now seemed to be invisible to most Americans. Some of them, according to Pavich, were war heroes who had earned Gold Stars, Purple Hearts and Awards of Valor. The question was: What could we do to help them? And so we did. For the next year, we videotaped interviews and events focusing on this national tragedy, and we called it The Invisible Ones: Homeless Combat Veterans. We approached California Congressman Bob Filner, Chair of the Veterans Committee, and Congresswoman Susan Davis, Chair of the Military Personnel Committee. We spoke to Gary Becks, Director of Rescue Task Force, and Brigadier General Bob Cardenas, who had tested the Flying Wing back in the 1940s. We also spoke to several homeless veterans in an attempt to understand their situation. How do these veterans become homeless? What is it like to be homeless? What are people doing to assist homeless veterans? We found out that most of the veterans on the streets have emerged from the Vietnam and Gulf War eras, although it is not unusual to see vets from the Korean War and even World War II. Veterans returning from Iraq and Afghanistan are now trickling onto the streets. Phil Landis, current CEO of VVSD, believes that the trickle will soon become a flood if we don’t put more energy into solving this problem. “To have our war heroes sleeping out there on the streets—it’s unconscionable,” said Dave “The Water Man” Ross, a San Diegan in his 70s and a Korean War veteran who has been passing water out to the homeless out of his own social security check for over four years. We interviewed The Water Man onsite in an inner city neighborhood in San Diego. The backdrop consisted of homeless people with shopping carts who were camped out on tarps, blankets and newspapers in front of a fenced-in dirt lot. I remembered growing up as a teen in Detroit, and then as a young woman in San Francisco. I had passed plenty of hulking figures and outstretched arms, not really understanding how they had arrived there, what I could do to be of assistance, or why it was even necessary for me to try and help. The scales fell from my eyes, so to speak, and I was ready to show my fellow Americans what is happening on the streets of our nation. Mark and I decided to donate copies of The Invisible Ones to citizens and concerned organizations that will show the film and help raise funds to assist homeless veterans. If possible, we only request $4 to help us with shipping. Homeless veterans are sleeping on our streets tonight, and we all have to help them. We Americans, who value our freedoms, who realize what sacrifices our service members have made, and who truly wish to help, can make a difference—starting right now. Find out more about The Invisible Ones at www.theinvisibleones.org or call 619.644.3000. Patty Mooney and Mark Schulze are partners of an award-winning San Diego video production company, Crystal Pyramid Productions, which has served broadcast and corporate clients since 1981. Visit www.crystalpyramid.com for more information. Well, gee-wis, the OB Rag has discovered the homeless. Better late then never. glad to see some attention on Sandy ego’s situation. I was in a band that plays at Stand Down every year. I can’t think of a more beautiful or rewarding audience to play for. These are OUR heroes and should never be forgotten. Stand Down was my 1st & last show in that group. I was in it from ’04 to ’07 so I played 4 of them and I tell ya, every year without a doubt Stand Down was my favorite gig, period. We were on national television, got major exposure, and made a pretty big splash but still those Stand Down shows were the simply best people to play for, ever! In OB and City Heights we have indigenous persons who have lived in our neighborhoods for years and consider the neighborhood their home even though they do not rent a house. These persons are “houseless” not “homeless”. We could easily make life better and more pleasant for these individuals. Schools, parks and public building could be designed and operated to provide access to sanitary washrooms, showers and dry sleeping platforms. The current approach is to shut out persons of need and to fence of these buildings to deny admission. Every park should have the showers and facilities we gladly provide to sun bathers at the beach. The Mayor and Council leadership try to weasel out of this municipal responsibility by placing the burden on the County of San Diego. They want to make human care someone else’s problem. The original charter of the City of San Diego contained a Department of Public Health and Social services (Article V Sections 60 -61. In the 60’s, based on promises of efficiencies, the voters permitted the consolidation of these services with the County Regional government. These promises have not been fulfilled and it is time to review the needs and meet or obligations. I think that in the upcoming 2010 City Budget adoption process we must consider a Maslow’s Hierarchy of Needs which addresses human health and survival needs first before any other matters and expenditures. Please ask the City leadership to spend at least as much on humans as animals in the 2010 Budget. $17 million dollars will go along way to meeting the needs of the poor and needy residents of our City. Finally, Solutions start with each of us and not just the government. Ask yourself, what are you doing to solve this challenge? Do you share? As a combat veteran, it myths me how our government can throw billions at a problem of homelessness and never solve it. None of the real questions are asked to get to the root of the problem. There are programs to get the vet of off drug and alcohol which are only symptoms of a bigger problem. Many fail to see that these people are economic victims of debts that can’t be forgiven and when they start working all their income is getting confiscated to pay back taxes and back child support. This system is vicious and unfair because these debt can not be forgiven and the interest on the debt is 10% compounding daily where there is no hope or escape many give up and live on the streets. The government treats animals better than they do vets and it a shame that the SD Housing Commission puts vets at the very bottom of the list and gives head of the line privileges to mothers and children when 78% of these vets are fathers that are unable to see their children because they don’t have a home to keep their children. Father Joe’s new residential tower was supposed to host many of these homeless vets and solicited donations to get these vets off the streets and then bait and switched their promise by allowing illegal immigrant families from Escondido to move in and betray the vets it was promised to. We need government to stop beating down vets and allow them to get clean slates so they can rebuild their confidence and get back to work.